From cheap bulk custom BIC ink pens to luxury Cross fountain pens engraved with your logo, we got your business’s writing needs covered. Some people look at promotional pens as an ancient idea when it comes to promotional products. However, don’t dismiss the idea of using them in your marketing campaign until you read this. You may think that pens are one of the least popular promotional items, but you would be wrong. In fact, they are one of the most popular and can lead to a great return on your investment. Studies have shown that people keep personalized pens for a long time and are also likely to give them to someone else once they are done using them. The brand impressions compared to the cost unbelievable compared to other promotional items. This is an item you can purchase in bulk on just about any size marketing budget. You can get customized pens in many different styles and colors. The low cost also allows you to purchase more of them for giveaway items or just to use around your office. They not only have been a widely used promotional product, but there are factors that show they will be used for many years to come. There are now stylus and 3D pens so don’t be surprised as new products roll into the market. Just don’t discount them because you think they are an ancient promotional idea. We will take you through some of the styles in a moment. But first, let’s take a look at why you should be considering the use of promotional pens for branding. Why Use Promotional Pens in Your Marketing Campaign? The most important answer to this question is simple: brand impressions! The point of using promotional products is to get your name out there in front of potential customers. The more brand impressions you receive, the more likely people are to remember you and become customers in the future. Keeping Gladwell in mind, why not make your logo the thing that is stored in someone’s memory? It is one of the best ways to brand your company and get people to keep coming back. According to the 2019 study by the Advertising Specialty Institute, customized pens are kept up to nine months by those who receive them. That means you not only make an immediate impression, but you have lasting impressions for at least six months. 89% of U.S. consumers own a writing instrument. Writing instruments are the most popular promotional item across the globe. 51% of people state they would be more likely to do business with the advertiser that gave them the promotional writing instrument. Brand impressions for promotional pens cost less than 1/10 of a penny. Writing instruments are one of the top 5 most influential products. So yes, branding is important. 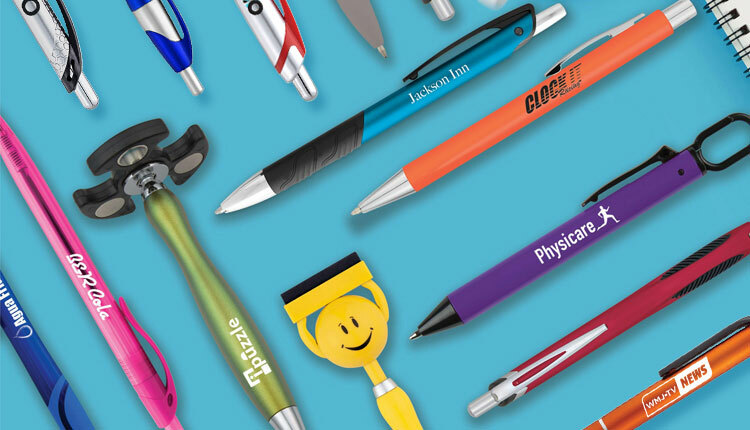 When you take into consideration the cost of using customized pens (less than 1/10th of a penny) for brand impressions, it is clear that using a promotional or personalized pen has a cost benefit. Bill Gates once said that if he was down to his last dollar, he would spend it on marketing. Well, if he spent it on promotional pens, he would get at least 1,000 brand impressions for that dollar. Now that you know the benefits, let’s take a look at some of the different styles of promotional pens you can choose from. Ballpoint pens are by far one of the most common type of writing instrument you will find. They are popular due to their availability and ease of use. You can order a customized ballpoint pen with blue, black, or red ink. You can also choose from dozens of different housings made from materials such as metal, plastic, and wood. Some ballpoint pens can also include added accessories. For example, you can get a 3-in-1 pen, pens with laser pointer or lights, and multi-tool pens containing all of the above. Another option for your promotional campaign is a customized gel or roller pen. When thinking of how technology has advanced writing implements, gel pens come to mind. Recent advancements with the ink used in gel pens have allowed it to absorb quicker on paper so you don’t have the mess like older model pens. Gel and roller pens come in a variety of different styles. You can get clickable pens as well as traditional gel pens with a removable cap. They also come in a variety of styles which range from traditional student type pens to executive looking metal housing pens. Speaking of executive pens, we carry a full line of them. These can make a great impression and are kept longer than traditional ballpoint pens. People see these as a high-end gift despite the fact that it still costs you less than a penny for each brand impression you will receive. Executive pens can be given away individually or in boxed sets. The style and customization combinations are endless. There are also executive pens with built in USB memory. These types of promotional pens serve a dual purpose and people are more likely to keep these for life, giving you more brand impressions than traditional pens. Since we brought up the idea of pen sets, we thought it was important to note that we carry quite a few different sets that include executive and other type of customizable pens. But don’t just think of pen sets as fancy gifts for executives. We also have combo pen/pencil sets as well as sets with pocket protectors and some that come in cases or tins. Also remember that we pass on our bulk pricing to you so you can purchase pen sets at the best price available anywhere. Stylus pens, also known as touch pens, are writing implements used to write with various electronic devices such as touchscreen computers and tablets. You use them to write like you would any normal pen, only the writing will appear on the computer screen. These are another example of how technology has advanced the promotional pen market. Get a personalized stylus with your company logo. These are perfect for the tech-savvy customers you are targeting. While they don’t replace traditional pens as of yet, they are being used more and more with brands such as Apple and Samsung who incorporate them into their products. These are very popular among younger people who embrace technology more than most. Now for promotional pens to satisfy the kid at heart. Novelty pens not only result in a large number of impressions, but also lead to conversation starters which could help influence buying decisions. We have a full line of novelty pens that are wacky, clever, and unique. For instance, there are pens with bottle openers and others that double as fidget spinners to reduce stress. Some come with carabiner clips to hook on backpacks while others have breakaway cords. Check out our full line of customizable pens to see if there is something that fills the novelty side of your marketing campaign. If you are looking for a writing instrument other than pens, we have you covered. Choose from many different styles of custom highlighters. Writing colors range from traditional yellow to pink and blue. Go with something people are used to like a removable cap highlighter or go with something unique like a five-prong highlighter which writes in five different colors. Permanent markers? Absolutely. These are easily customizable, and people are always looking for them. It would make a great impression if its your brand they see when they need one. How about promotional pencils? These are perfect for a variety of professions. Choose from traditional No 2 pencils for school or even carpenter pencils for the blue-collar worker. You have the option of untipped or eraser tipped pencils. Colors range from your everyday colors of the rainbow to shades such as neon or mood pencils. You can also get pencils in gift sets. If you are unsure if we carry the brand you want, simply do a search in the box at the top of the page. Or, you can call one of our sales specialists who can walk you through the different brands and customizable options we offer. Make the decision to use promotional pens in your marketing campaign. They make great gifts, are inexpensive, and are kept for a long time by those who receive them. Compare the cost (1/10th of a penny) to other forms of marketing and you will see that using customizable pens are one of the best investments out there. Promotional pens give you countless options from ballpoint, gel, or executive styles. Various housings made of metal, plastic, and wood also give you more options. Ink and exterior colors can be customized as well so you can get the right pen for the right person at the right cost. Still not sure? Give one of our customer service reps a call to find out the different options that fit your budget and marketing campaign.